Stories Of A Happy Mom: Summer...that's a wrap! It's always bittersweet when summer comes to an end.. One one hand, I get very excited for a new school year and for some "me" time but then I start thinking of how much I'll miss the kids and our fun days and I get a little sad.. But such is life and here we are at the end of yet another fun summer, nothing short of great anecdotes and tons of awesome memories! The first important event of the summer was Mariana's baptism on June 11th. We had a great gathering with friends and family to celebrate this cutie's special day. She looked so adorable with her baptism gown and the day was just filled with love and faith. Iggy is her godfather so the event was extra special. We spent lots of time at the pool so the kids got extra tanned... including "ghostly" Oliver.. ha! In mid June we traveled to the Dominican Republic for a couple of weeks. We spent some time with family including Iggy's uncle Javi and my aunt Laurita who flew in from Venezuela. It's always great to spend time with loved ones and even better while on vacation. Right after we came back from Dominican Republic we headed to Ohio to visit my brother in law and his family. The girls had an amazing time with their cousins and it was great to see our family. 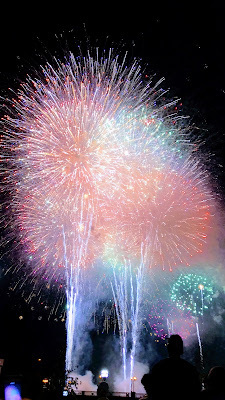 While in Ohio, I met up with my good friend Jenn, attended a great firework display on the 4th (Red, White and Boom! in Columbus, OH), celebrated Iggy's (and Sebastian's) birthday and just relaxed while soaking in all the family time that was possible. It was really a great trip. On the day we got back from Ohio, I took my dad to the Paul McCartney concert and that was definitely one of the highlights of my summer.. What a great show and spending time with my dad was even better! Unforgettable memories! My friend Jenn and her son Maddox came to visit from Ohio (they just couldn't stay away... ha!) and we had an amazing time with them. I love it when people visit us! In early August, we went to the GunsNRoses concert with some friends. Even though I'm not much of a "rocker", I had a blast and it was a great night! My cousin Ana and her kids came to visit from Colombia.. we had a great time.. The BEST firework show EVER! When we got back from Orlando, I went to Field of Flowers with some of the school moms for a last minute "back to school" celebration. We made some cute arrangements and had a great time. All in all, summer 2017 was another one for the books. I hope that when my kids get a chance to read this blog in their older years they know how lucky they are and how many blessings they are able to enjoy on a daily basis. Now to start another wonderful school year! Happy end of summer, y'all! Death is "simple" but a loss is never "easy"